Irene Nemirovsky was a prolific Ukrainian novelist and biographer. Best known for her unfinished Suite Frangaise, a book composed of two novellas about life in France during the Nazi occupation, Nemirovsky has been the subject of a wide range of criticism. Present-day scholars are impressed with her eloquence and critics are appalled by her more than implicit anti-Semitism— despite her Jewish origins and the fate of European Jews at the hands of the Nazis. Russian, French, and Jewish Influences. Irene Nemirovsky was born on February 11, 1903, in Kiev, Ukraine. Her father, Leon Nemirovsky, was a rich Jewish banker; Irene’s mother was not interested in her. The Nemirovsky family lived in Saint Petersburg in Russia, where the young Irene was brought up by a French governess. The environment almost made French her native tongue; however, she also spoke Yiddish, Basque, Finnish, Polish, and English. In 1918, following the start of the Russian Revolution, the Nemirovskys moved to Finland. The following year they moved to Paris, France, where the eighteen- year-old attended the Sorbonne and began her writing career. In 1926 Nemirovsky met and married Michel Epstein, a banker, and three years later, she had her first child, a daughter named Denise. Elisabeth was born in 1937. Early Novel and Film Success. In 1929 Nemirovsky’s novel David Golder was published. The book drew upon the author’s own experiences as the daughter of a Jewish banker. The novel was an early success in Nemirovsky’s budding career, and in 1930, the book was adapted into a film, featuring Harry Baur as David Golder. The same year also saw her novel De Bal become a movie and a play. More success followed, with Nemirovsky being hailed as one of France’s most talented young authors. She was so successful that she was bringing in an income that surpassed that of her banker husband. Jewish Condemnation and Flight from Paris. Nemirovsky converted to Catholicism in 1939, a year after she and her husband tried to gain French citizenship. Nemirovsky had also been writing for two arguably anti-Semitic magazines. 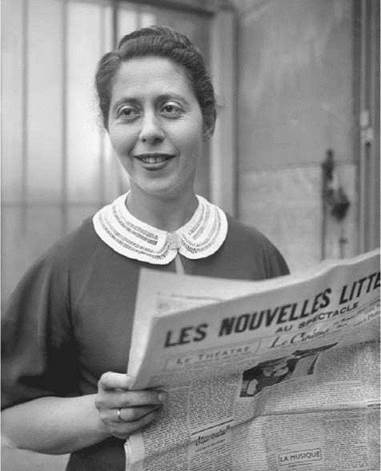 In 1940, after Nazi troops had occupied a large portion of France, Nemirovsky’s husband was unable to work at the bank and her books could no longer be published due to her Jewish ancestry. Like other Jewish people, she and her husband were forced to wear the yellow Star of David. Apparently attempting to disclaim any Jewish connections, Nemirovsky wrote a letter to Marshal Petain, who had just become head of Vichy France, a region that remained free from direct German control only through its willing cooperation with Nazi policies. She expressed how ‘‘greatly distressed’’ she was by the ‘‘fate’’ she feared awaited her and her family, and made efforts to explain that she and Epstein were born in Russia, but their children were born in France and she and her husband had been living in France for twenty years and had tried without success to gain French citizenship. Her reasoning and petitions went ignored. When the Nazis came to occupy Paris, Nemirovsky and her family fled Paris, taking up residence in a village called Issyl’Eveque. Nemirovsky wrote stories based on what she experienced and expressed her apparent shock at the rapid moral decline she saw in France—the French people showing their basest sides under the pressures of Nazi infiltration. Her view of mankind became very bleak, and she wrote the beginnings of a multipart work that she planned to be structured like a symphony. On July 13, 1942, before Nemirovsky could complete her work, she was arrested by the Vichy police. In accordance with Nazi German rule, Nemirovsky was taken from her family and as a ‘‘stateless person of Jewish descent’’ was transported to the concentration camp at Auschwitz, where she died of typhus one month later. The Surviving Suite Frangaise Manuscript. After her arrest her husband, Michel Epstein, pleaded with the German ambassador for her release, arguing that his wife’s family had never practiced Judaism (and there is no indication that they had) and claiming that Nemirovsky’s writing was most often anti-Semitic. But his pleading was to no avail. Instead, he too was deported to Auschwitz and died three months after Nemirovsky. Nemirovsky and Epstein’s daughters escaped capture and lived on the run. Before fleeing their home, the elder child, Denise, grabbed a small suitcase that had belonged to her mother, containing photographs and what Denise thought was a diary. Denise took this suitcase with her from one hiding place to another, but even after the war had ended, she avoided reading the ‘‘diary,’’ fearing it would bring up painful memories. When Denise finally did read her mother’s writing, she found not a diary but an unfinished novel about the panicked exile from Paris when the Nazis marched in. Published as Suite Frangaise (2004), the book drew international acclaim. Anne Frank (1929-1945): Known throughout the world for the posthumously published Anne Frank: The Diary of a Young Girl (1947). Anne and her family went into hiding when the Germans occupied Amsterdam. Zora Neale Hurston (1903-1960): African American writer who paved the way during the Harlem Renaissance for future African American women writers. Clare Booth Luce (1903-1987): American editor, activist, and writer, she was also a high-profile socialite, a congresswoman with a Republican seat in the House of Representatives, and an ambassador to Italy. George Orwell (1903-1950): Celebrated English author and journalist, he concerned himself with government, politics, language, and censorship. Anti-Semitism. Critic and scholar Ruth Franklin suggests that Nemirovsky found her style early on, becoming ‘‘predominantly a novelist of society, somewhat in the vein of Edith Wharton, but with an acerbically satirical tone that negates the possibility of authorial compassion for her characters.” From the start, claims Franklin, Nemirovsky’s fiction involved ‘‘anti-Jewish stereotypes that would become something of a trademark.’’ For example, in an early novella entitled The Misunderstanding (1926), the critic points out, ‘‘an aristocrat consults a Jewish coworker for financial advice: a ‘typical young Jew, rich, elegant, with a long pointed nose in a narrow, pale face.’ And the Jew takes advantage of his colleague financially.’’ David Golder (1929), which Franklin calls ‘‘an appalling book by any standard,’’ further exploits the Jewish stereotype. Whether veiled or explicit, anti-Semitism was hardly uncommon in European literature of the early part of the twentieth century. Writers as prominent as T. S. Eliot, Ezra Pound, and Ernest Hemingway have all, more or less rightly, been accused by critics of employed Jewish stereotypes in their works. The fact these stereotypes were so pervasive helps explain to some degree why the world was so slow to respond to the threat posed by Adolf Hitler’s anti-Jewish agenda. The Birthday Party (1958), a play by Harold Pinter. In this realist drama the playwright features an innocuous Webber and a calculating Goldberg who represent the extremes. Daniel Deronda (1876), a novel by George Eliot. In this social satire the author explores the search for a national identity and a definition of the self as a Jewish person during Victorian times. Maus (1977), a graphic novel by Art Spiegelman. In this unusual but provocative format for the story of the Holocaust, the Jewish people are portrayed as mice and the Nazis are depicted as cats. The Merchant of Venice (c. 1596-1598), a play by William Shakespeare. Though he attempts to retain his dignity as a Jew, the infamous Shylock has gone down in literary history as the stingiest of penny-pinching moneylenders. Shylock (1976), a play by Arnold Wesker. Using the original stories upon which Shakespeare based Merchant, the playwright places his loan-banker protagonist in a 1563 Jewish ghetto in Venice. In Suite Frangaise, Nemirovsky does not write about the condition of Jews in a Nazi-occupied France. Instead, her stories highlight the relationships between the French and the Germans as the Germans begin to invade their homeland. Critics have been impressed with the fact that Nemirovsky found it possible to show the German soldiers in a sympathetic light. Most noted is her compassion and her balanced viewpoint against those who have sent her to the concentration camp. Nemirovsky’s presentation of the German soldiers contrasted the popular anti-German sentiments during the time that she was writing the novel. 1. Do you think Nemirovsky’s book Suite Frangaise would have been well received if people did not know about her own tragic end? Is the novel more relevant due to her personal tragedy? Explain your response in a short essay. 2. Visit the Museum of Jewish Heritage online. Investigate the artifacts, art, and diary entries found on the second floor, which features the Holocaust Memorial material. Choose a poem that has relevance to you. Share the poem with a group and discuss its significance. 3. David Golder is the story about a villainous Polish Jew. Do you think Nemirovsky wrote the book to stereotype Jews, or does the book have a more universal message? Discuss your opinion with the class, using excerpts from David Golder to support your view. Gille, Elisabeth. Shadows of a Childhood: A Novel of War and Friendship. New York: New Press, 1998. Weiss, Jonathan. Irene Nemirovsky: Her Life and Works. Palo Alto, Calif.: Stanford University Press, 2006. Dunmore, Helen. ‘‘More War than Peace,’’ Review of Suite Frangaise.’’ The Guardian (March 4, 2006). Franklin, Ruth. ‘‘Scandal Franyaise.’’ The New Republic (January 30, 2008). Gray, Paul. ‘‘As France Burned.’’ Review of Suite Frangaise.’’ New York Times (April 9, 2006). Kemp, Peter. ‘‘The Secrets of the Notebook.’’ Review of Suite Frangaise.’ ’ U.K. Sunday Times (March 5, 2006). La Farge, Paul. ‘‘Behind the Legend. ’ ’ Review of Suite Frangaise.’ ’ Nextbook (September 12, 2006). Press, Jacob. ‘‘Firing the Canon: The Jewish Stereotype in Anglo-American Culture.’’ Mosaic 10 (Spring 1991): 51-61. Riemer, Andrew. ‘‘Review of Suite Frangaise. ’ ’ Sydney Morning Herald (March 23, 2006). DeLaby, Guillaume. Irene Nemirovsky: The Definitive Website. Retrieved June 4, 2008, from http://pagesperso-orange.fr/guillaumedelaby/en_index.htm. Durant, Erin. The Brooklyn Rail. Writing in the Dark: The Story of Irene Nemirovsky. Retrieved June 4, 2008, from http://www.thebrooklynrail.org/books/sept05/Nemirovsky.html. Posted September 2005. Jew Wishes. On Irene Nemirovsky by Jonathan Weiss. Retrieved June 4, 2008, from http://jewwishes.wordpress.com/2007/09/30/jew-wishes-onTrene-Nemirovslcy-by-jonathan-weiss. Posted September 30, 2007.